In the end of 19th century, among the sites of Smolensk there was a building, located on the Communist Street, 6th house, which was built in 1886 by order of the Smolensk City Council for its using. 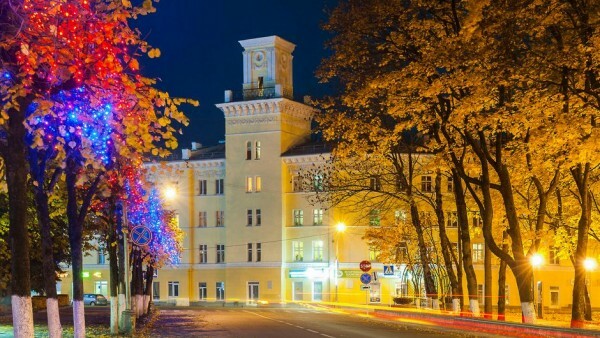 The old-timers of the city often call it «the house with a watchtower.» This is due to the original view of the building, which we can see in the pictures of the old Smolensk. In 1917, the City Duma building was nationalized and after the war it was rebuilt significantly and adapted for housing and accommodation stores. But it was noteworthy not because of this, but because of the appearing here the first Smolensk Museum. Its creator (with the assistance of the mayor A.P. Engelhardt) was the gymnasium teacher, scientist, ethnographer, author of books on the history of Smolensk S.P. Pisarev. The city visitor was certainly proposed to see the hall, decorated with paintings by artists. The real property of the museum are paintings of the Russian wanderer, our countryman N.P. Bogdanov-Belsky. Nikolai Petrovich Bogdanov-Belsky painted mostly genre paintings, especially about the peasant children education, portraits, impressionistic studying of landscapes. The most famous of his paintings are: «Mental calculation», «Near the school door», «Reading the letter.» Many of his works are in big museums and galleries around the world. Visitors mind was also turned to the portraits of Smolensk senior citizens, two merchants — Pestrikov and Lanin. Of course, there were a lot of well-known merchants in Smolensk, but why where these people given a special honor? Osip Pavlovich Pestrikov spent his money to build in our city a three-floored stone building for the trade school, that he supported himself. He gave a huge amount of money to support a hospital for the poor. Fyodor Lanin was in step with Pestrikov in charity. He founded and supported in Smolensk «free fire society», built and financed the hospice, renovated the Lower St. Nicholas Church, donated substantial sum of money to improve the city, founded the fund to help brides-dowerless, was a member of orphanages guardianship and allocated resources to them. Nowadays, the house down the street is the object of the Communist cultural heritage.